For this project, Susan put together her own plan, based on a specific building she wanted to model. She liked doing it so much that she hopes to do more. Like so many others, I recall those little houses from childhood. Being a railroad brat (from the real life R.R. ), you'd think I'd love trains. My Dad worked for the railroad for 47 years, and our family had Lionel trains in the basement. However, I was never fascinated with the trains. I loved the little towns that grew up alongside the tracks, that is, the Lionel tracks that my brother spent countless hours adjusting so his trains wouldn't jump them. My uncle would glue plastic pieces together to create buildings that would go alongside the track once my brother was finished setting up. To me, producing and arranging the buildings was the best part of the whole display. Hey, I was a kid and never knew about model kits. It was all magic to me. 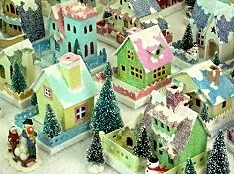 In addition, my mother had the little cardboard houses under the tree every year. I have since enjoyed seeing buildings just like hers on many internet sites, so it's nice to know that other people still enjoy these structures today. I just happened to stumble upon LittleGlitterHouses.com before this past Christmas. I had planned on creating some houses for my sister. She deserved some new ones to go along with the homes on the "other side of the tracks." With one look at that site, I was hooked. I created 4 houses and 1 church for my sister. 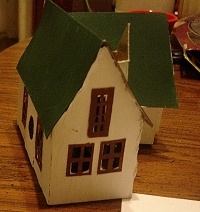 Then I started thinking about creating houses as replicas of actual structures. The house in these photos is a copy of the main house at a campsite in the Adirondack Mountains. As you can see, it is different than others around. The base is 5 1/4" x 8 1/2". 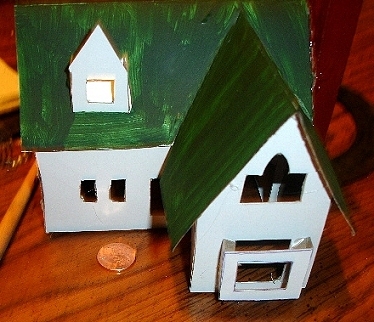 The house itself is roughly 4" high, and the chimney is 5 1/4" high. 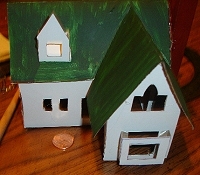 The house is 5 1/2" wide x 4 1/2" deep. Susan's "basic structure." She made her own plans from scratch and tweaked them until she had the proportions she wanted. Click for a bigger photo. Susan has added brown-painted windowframes. The diamond-framed picture window is a nice detail. 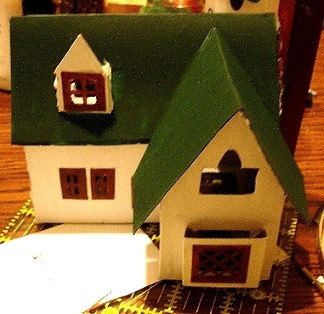 Susan hasn't added the dormer roof yet, which looks a little funny in the next photo, but you get the idea. Click for a bigger photo. This photo shows the same stage of the building from another angle. Click for a bigger photo. 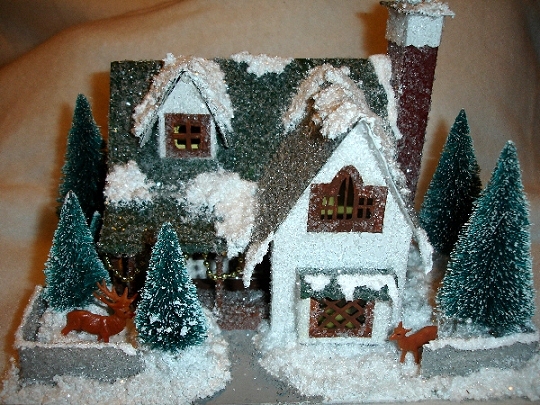 This photo shows the house after Susan has spread fake "snow" on it, then glued glitter on every surface, and added a base, fence, deer, and trees. 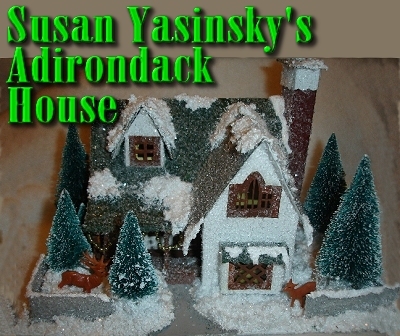 It has all of the charm of a traditional glitterhouse, while retaining an "Adirondack" feel. Click for a bigger photo. I've only worked in clay to create houses, but this cardboard method is great, and it's very simple to place a hole in the back for a light. 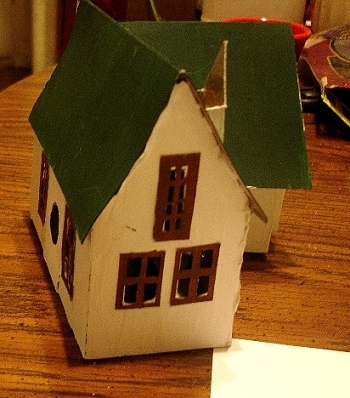 This is so much fun, I'm thinking of taking commissions to build "replica" houses for other folks. What do you think? If you'd like to get in contact with me, use the BigIndoorTrains contact form to get in touch with Paul, and he'll forward your note my way. Big Indoor Trains™ and LittleGlitterhouses.com™ are looking for your ideas, projects, or photos - Also, if you have similar project, ideas, or photos that you'd like to share with your fellow readers and hobbyists, we'd love to add them to our sites, and we'll be sure to give you full credit for your contribution. About Nativities - Describes how German-American Nativity displays (the original "putzes") grew into communities and landscapes that included pasteboard "putz" houses and even electric trains.